We are officially starting our Intriguing Healthy Hair Challenge February 1, 2017. We are opening this to anyone looking to retain and grow their hair throughout 2017. This is especially for anyone natural who is frustrated and having a hard time maintaining their hair on their own. This is also for individuals who believe their own hair cannot grow, and have been stuck at the same hair length for some time. We are only using products that we have already seen results for. As with using any new products. I would recommend checking the ingredients prior to using too make sure you have no allergens to them. Our first focus will be taking care of the hair that is already on our head. Joining our Intriguing Healthy Hair Challenge typically requires a behavior change in the individual. You have to be committed to the process. We are asking for a daily commitment and weekly commitment. Everyone has their own starting point, when they decide enough is enough! It’s time to get back on track or even for the first time want to see a real hair change within themselves. It may be similar or different from mine. But we all want the same outcome either increase length, thickness or both. A huge factor in most who don’t retain length. This can include someone whose hair is broken, dry, brittle damaged or even someone who has had the same length of hair for some time. The daily commitment to retain length will be moisturizing daily and completing a wash and deep condition weekly. Yes, even those with weaves can participate. Our first recommended product is Carols Daughter Monoi repairing collection which can be found at https://www.ulta.com/monoi-repairing-3-piece-starter-kit?productId=xlsImpprod4210185 the cost for this product is $26. 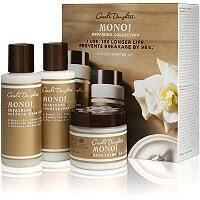 The Monoi Repairing 3-Piece Starter Kit by Carol's Daughter prevents breakage by 96% and let's hair live 13x longer! * After just 1 use, you'll have stronger, longer invincible hair. *Independent studies were conducted on instrumental results versus control when used with Monoi Repairing Shampoo and Hair Mask for 30 minutes. Shampoo: Simply apply to wet hair and massage into the scalp until you see a good lather. You handle the rinse and, if needed, the repeat...they'll handle the repair. Conditioner: Work a generous amount through clean, wet hair. Gently massage into your scalp and hair, giving your ends a little extra TLC. Let it work its magic for 3-5 minutes and rinse well. Mask: Massage gently into clean, wet hair, giving a little extra love to your frazzled ends. Leave the treatment mask on for 5 to 7 minutes and then rinse well. Or, for an even deeper treatment, put on a plastic cap and sit under a dryer for 10 to 15 minutes. Shampoo: Water (Aqua), Disodium Laureth Sulfosuccinate, Sodium Lauryl Sulfoacetate, Sodium Cocoyl Isethionate, Cocamidopropyl Betaine, PEG-7 Glyceryl Cocoate, PEG-150 Distearate, Sodium Lauroyl Sarcosinate, Cocamidopropyl Hydroxysultaine, Decyl Glucoside, Sodium Lauroyl Oat Amino Acids, Coconut Oil Glycereth-8 Esters, Shea Butter Glycereth-8 Esters, Polyglyceryl-3 Laurate, Cocos Nucifera (Coconut) Oil, Gardenia Tahitensis Flower Extract, Orbignya Oleifera Seed Oil, Phyllostachis Bambusoides Juice, Moringa Pterygosperma Seed Extract, Helianthus Annuus(Sunflower) Seed Extract, Hydrolyzed Hibiscus Esculentus Extract, Cassia Angustifolia Seed Polysaccharide, Hydrolyzed Silk, Panthenol (Pro-vitamin B5), Glycerin, Glycol Distearate, Cinnamidopropyltrimonium Chloride, Guar Hydroxypropyltrimonium Chloride, Quaternium-91, PPG-3 Benzyl Ether Myristate, Disodium EDTA, Potassium Sorbate, Citric Acid, Chlorphenesin, Phenoxyethanol, Methylisothiazolinone, Fragrance (Parfum). Conditioner: Water (Aqua), Cetearyl Alcohol, Stearamidopropyl Dimethylamine, Glycerin, Isododecane, Fragrance (Parfum), Behentrimonium Methosulfate, Isohexadecane, Cocos Nucifera (Coconut) Oil, Gardenia Tahitensis Flower Extract, Butyrospermum Parkii (Shea Butter), Orbignya Oleifera Seed Oil, Moringa Pterygosperma Seed Oil, Phyllostachis Bambusoides Juice, Hydrogenated Coco-Glycerides, Hydrolyzed Silk, Hydrolyzed Hibiscus Esculentus Extract, Cassia Angustifolia Seed Polysaccharide, Helianthus Annuus (Sunflower) Seed Extract, Panthenol (Pro-vitamin B5), Cetrimonium Chloride, Cetrimonium Methosulfate, Cinnamidopropyltrimonium Chloride, Guar Hydroxypropyltrimonium Chloride, Octyldodecanol, Ceteareth-20, Quaternium-91, Citric Acid, Tetrasodium EDTA, Sorbic Acid, Chlorphenesin, Phenoxyethanol, Methylisothiazolinone. Mask:Water (Aqua), Cetearyl Alcohol, Stearamidopropyl Dimethylamine, Glycerin, Cetyl Esters, Dimethicone, Fragrance (Parfum), Behentrimonium Methosulfate, Cocos Nucifera (Coconut) Oiol, Gardenia Tahitensis Flower Extract, Cyclopentasiloxane, Isohexadecane, Butyrospermum Parkii (Shea Butter), Orbignya Oleifera Seed Oil, Moringa Pterygosperma Seed Oil, Phyllostachis Bambusoides Juice, Hydrolyzed Hibiscus Esculentus Extract, Cassia Angustifolia Seed Polysaccaride, Helianthus Annus (Sunflower) Seed Extrac, Panthenol (Pro-vitamin B5), Cetrimonium Chloride, Cetrimonium Phenyl Trimethicone, Dimethiconol, Octyldodecanol, Ceteareth-20, Quarternium-91, Citric Acid, Phenoxyethanol, Methylisothiazolinone. This will be used weekly on your designated wash day. You will need to set aside a few hours, to complete this. Why? It is very imperative that you take your time when caring for your hair. Most clients lose 10-30% of their thickness because of pulling, tugging, and ripping their hair out when caring for it. Please use wide tooth combs and start from end to root. Make sure your slowly detangling your hair. Only you have the power to show your hair the love it deserves! Additionally I would like to touch on why we’re requiring a weekly wash. It has been my experience that a clean scalp usually means a healthy scalp. Intriguing Hair Fact: Signs of an unhealthy scalp include dandruff, itchiness, and scabs. Washing more frequently will assist in eliminating signs of an unhealthy scalp. If this does not help, please contact your doctor. The second portion will be growth of new hair we will be using two products which will assist in us growing our hair at a much faster rate. Typically African American women grow about a ½ inch per month. Using these products our natural clients have seen 1 inch of growth each month! Both of these products have been formulated by an African American female whom is a doctor. Prettea: This hair growth tea is formulated to facilitate healthy, stronger hair – from the inside out. The synergy of ingredients will relax the spirit while delivering the nutrients to the body that it needs for longer, stronger and healthier hair. Each ingredient was chosen for its unique healthy hair properties. Taken in conjunction with one of our many other amazing products, you will see even more beneficial and amazing results! Now… sit back, relax and enjoy being PRETTEA. Grow On The Go: Grow on the Go Supplement Pink Lemonade Drink tastes great! With 500mcg of biotin and over 1500mg of our proprietary beauty complex, you can drink your way to healthier, longer, stronger hair. As an added bonus, you will also experience more radiant skin! Whether you are pressed for time or just want to add additional supplements to your healthy hair and Beauty Journey, Grow on the Go is your answer. Just mix… and go. I hope you’re as excited about this as me! We are officially starting our Intriguing Healthy Hair Challenge for 2017. We are giving you the tools to make the necessary changes today. We also will be gifting participants throughout the year with free protective styling and more. Join our Facebook Group Intriguing Healthy Hair Challenge. We will be able to communicate and keep in contact with everyone. We will also be launching on a more personal level for our new and existing clientele a specific Intriguing Hair Regimen for them to follow at home.